You typically won’t need any kind of special permit when using this portable wash pad, whether you use it as a car wash pad, vehicle wash pad, heavy equipment wash pad or for some other purpose. This is a self-contained unit that’s easy to set up above ground without affecting the surrounding architecture or environment, so there’s no real reason to expect a permit would be necessary. This, combined with the fact that they’re so portable, means you can easily wash your vehicles almost anywhere. It saves you money since you need to use less water to wash your vehicles. It satisfies the EPA, since you’re keeping your contaminated water from seeping into the environment. It prevents you from contaminating the groundwater of the surrounding area, so you won’t endanger your own property or the property surrounding wherever you’re washing your vehicle. 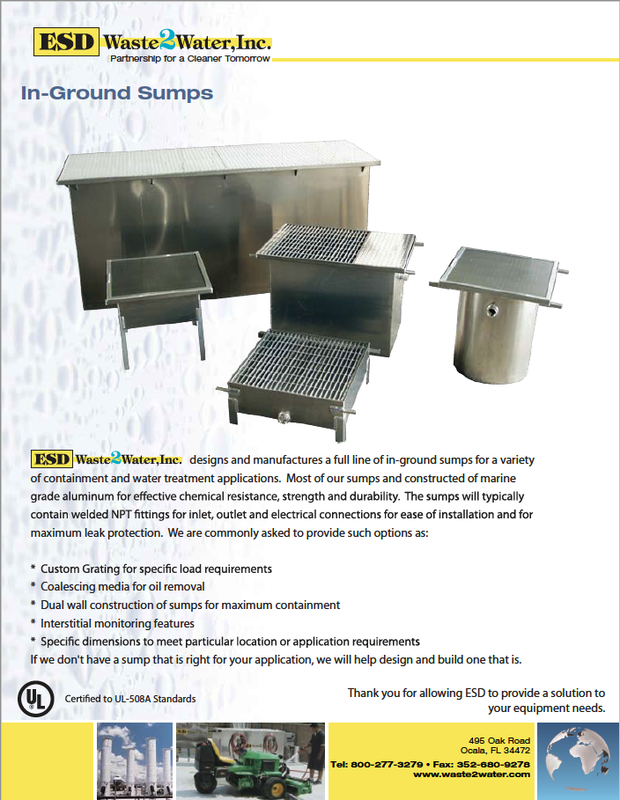 Containment Island Modules by ESD can be assembled together to create a multitude of wash pad configurations – easily and economically. 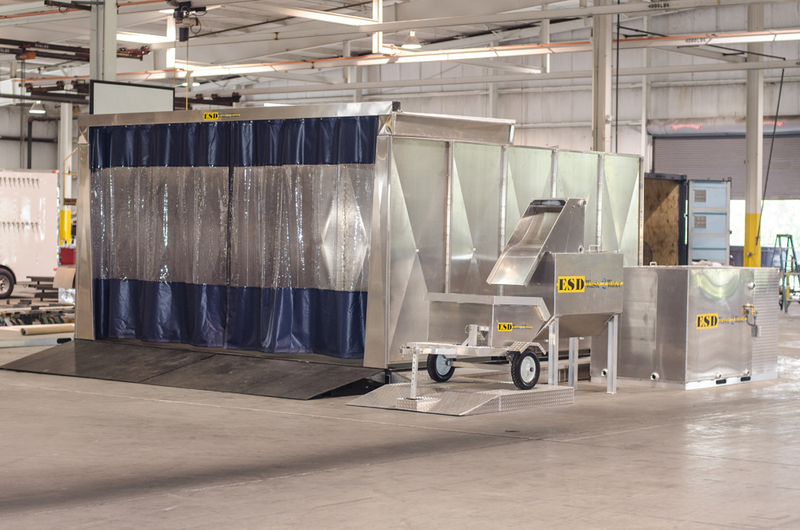 By using the 8’x12′ or 8’x16′ modules, you can create a wash pad to meet your size and load capacity requirements. 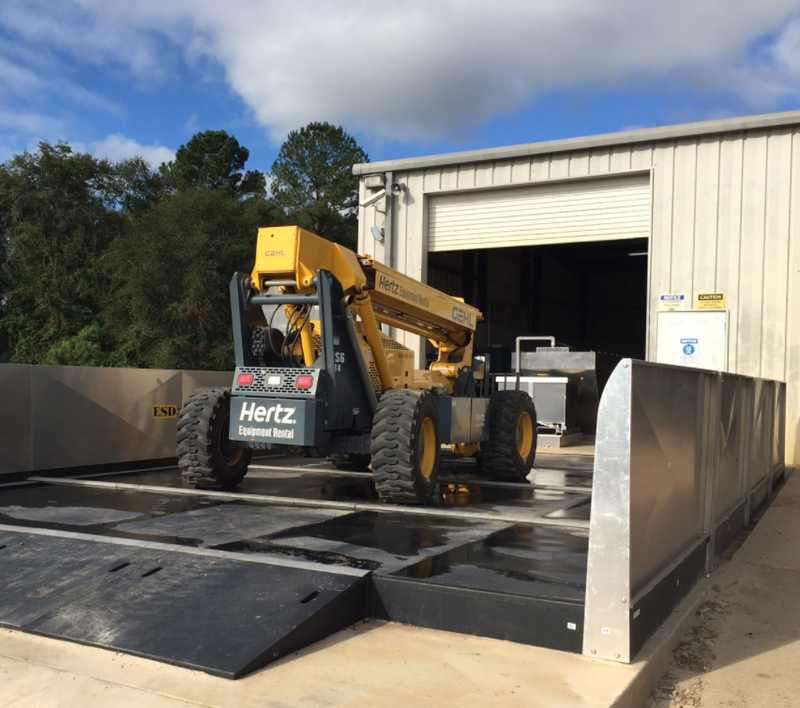 Optional Accessories like walls and ramps allow easy customization to your specific operations. The addition of an add-on biological wash water recycle system, transforms your new contained wash area into a closed loop system that can be used with pressure Specifications: washers or High Volume Wash Systems. The above ground pad design is easy to setup and maintain. 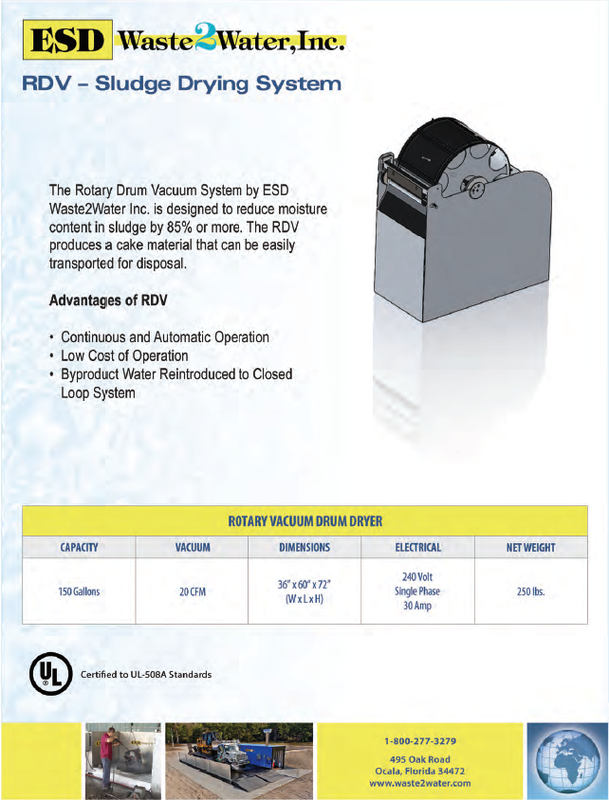 It captures and controls your wastewater and avoids soil and groundwater contamination. Plus, it is portable by design so it can be easily relocated. ESD offers expert design and configuration assistance – contact us to discuss your application. operation or pretreatment for discharge to approved sanitary sewer. 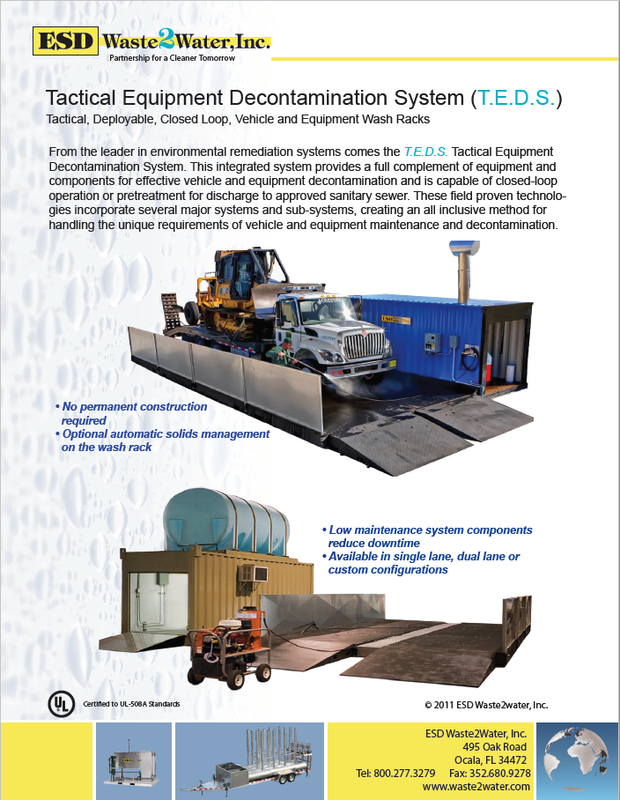 These field-proven technologies incorporate several major systems and sub-systems, creating an all-inclusive method for handling the unique requirements of vehicle and equipment maintenance and decontamination. The Mobile Decontamination & Wash Station is a self-contained wash bay with a closed loop wash system with (1) high pressure, hot water hose station for efficient and environmentally friendly washing. 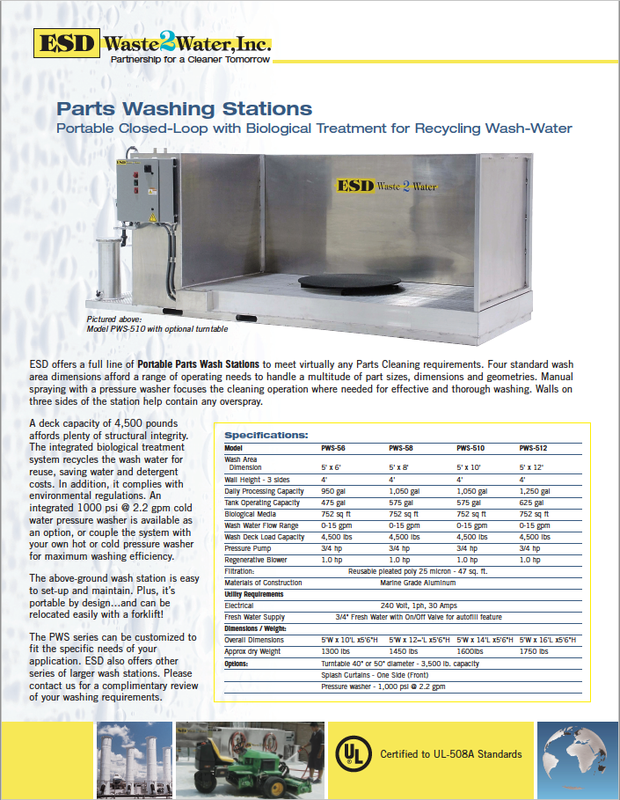 The portable equipment enclosure includes all plumbing, pumps, electrical connections, lighting, and HVAC to operate as a complete wash station delivery unit. Above-ground pad system, all steel construction with 8’ modules for expansion (or shortening). Usable pad dimension 14’ wide x 40’ long. 30-ton per axle load capacity. This makes the perfect heavy equipment wash pad. 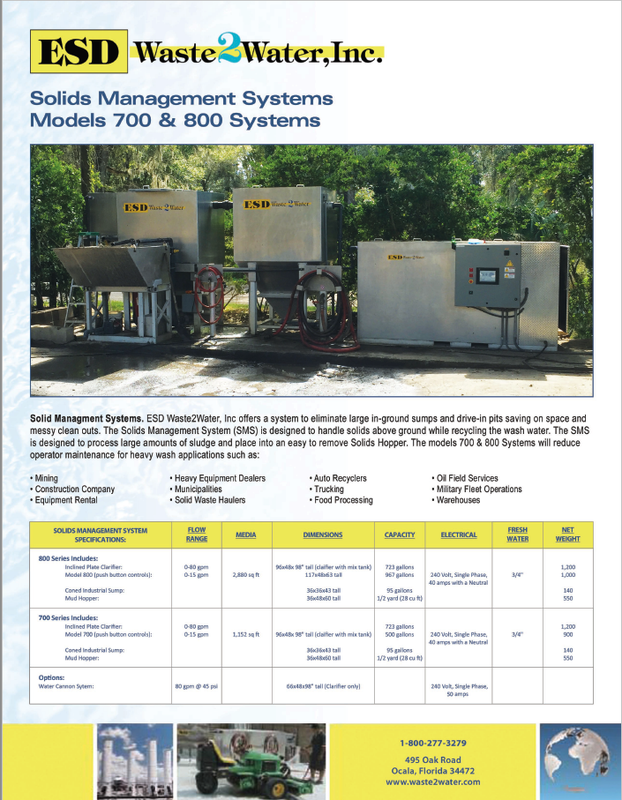 Environmentally controlled with equipment enclosure to include all water treatment equipment, pressure washer, and associated equipment with all plumbing, pumps, electrical connections, lighting, and HVAC to operate as a complete wash station delivery unit. The equipment enclosure is thermally insulated on all sides and includes steel beam, stainless steel, and aluminum construction. The building complies with the “International Convention for Safe Containers”-CFC. The container can be transported by standard truck trailer, lifted by a forklift or ocean cargo handling equipment or sling lifted by a crane. A hot water pressure washers enclosed in a 40′ long equipment container. 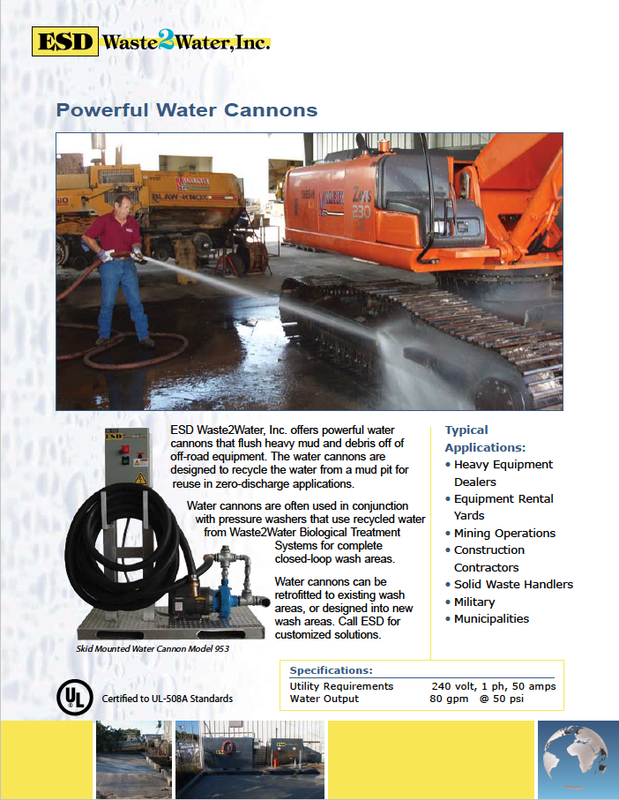 ESD Waste2water,INC. 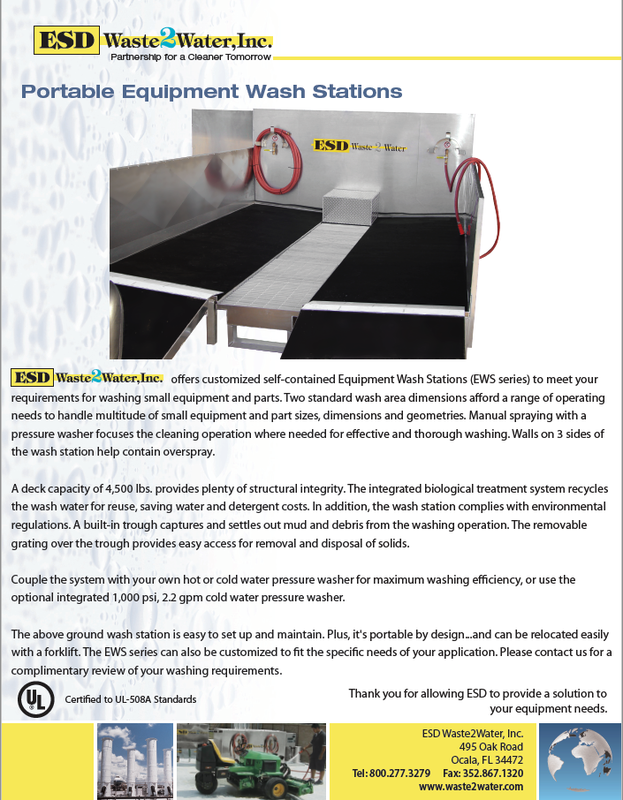 offers customized self-contained Equipment Wash Stations (EWS series to meet your requirements for washing small equipment and parts. 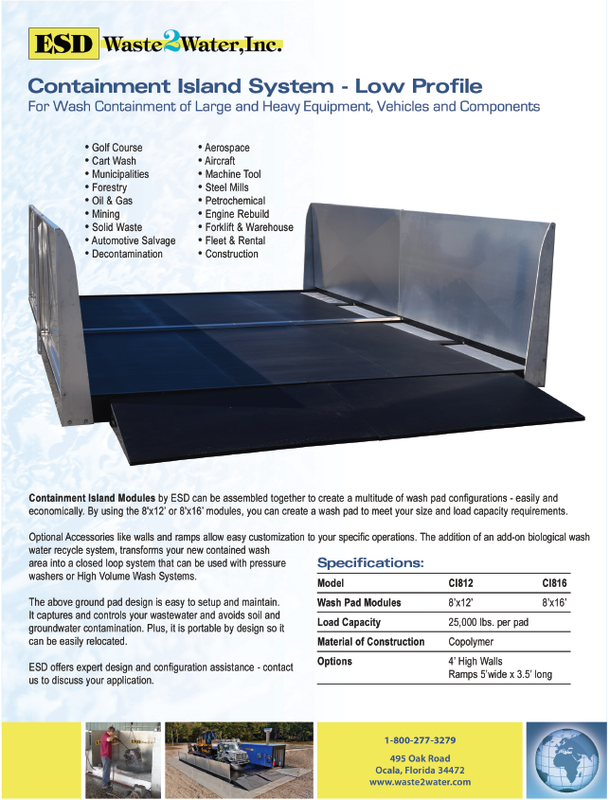 Two standard wash area dimensions afford a range of operating needs to handle multitude of small equipment and part sizes, dimensions and geometries. Manual spraying with a pressure washer focuses the cleaning operation where needed for effective and thorough washing.Walls on 3 sides of the wash station help contain overspray. A deck capacity of 4,500 lbs. provides plenty of structural integrity.The integrated biological treatment system recycles the wash water for reuse, saving water and detergent costs.In addition,the wash station complies with environmental regulations.A built-in trough captures and settles out mud and debris from the washing operation.The removable grating over the trough provides easy access for removal and disposal of solids. Couple the system with your own hot or cold water pressure washer for maximum washing effciency, or use the optional integrated 1,000 psi, 2.2 gpm cold water pressure washer. 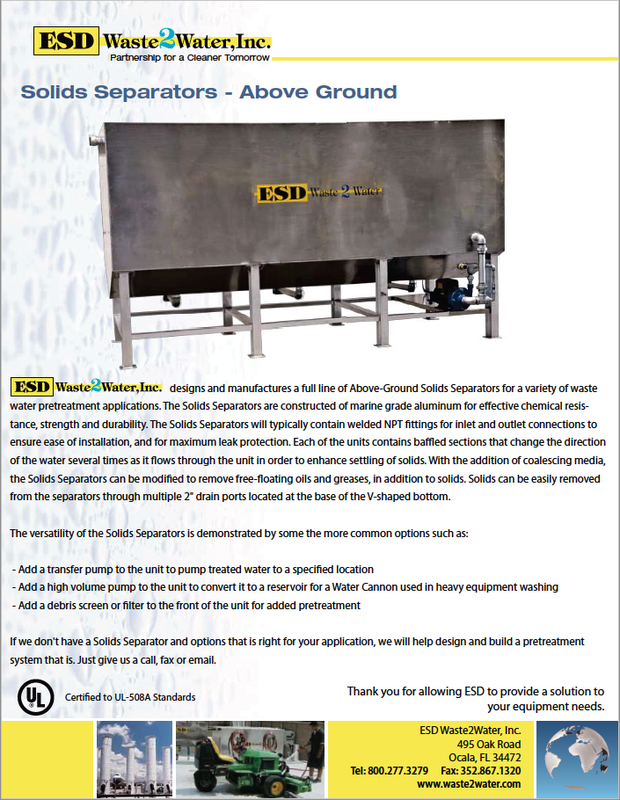 The above ground wash station is easy to set up and maintain.Plus, it’s portable by design…and can be relocated easily with a forklift.The EWS series can also be customized to fit the specific needs of your application.Please contact us for a complimentary review of your washing requirements. Convenience: You can customize these portable wash pads to fit a variety of applications. Choose different sizes, add walls or ramps and do whatever you need to wash anything from a golf cart to a small aircraft. And of course, you can set them up anywhere, in ground or above ground. It’s a snap to set up, no permits or special equipment are needed and you can start washing right away, wherever you are. When you’re done, move it right along to the next spot. Cost-Effectiveness: Because the system can treat and reroute the water back to you, you use less water, saving you on costs. You also need fewer wash pads because you can transport them from location to location. Plus, you don’t have to take multiple vehicles out of commission by sending them to a central location to wait for a wash — you can wash them anytime, anyplace with your portable wash pad. Environmental Soundness: Normally, washing your vehicles can create wastewater full of contaminants that can contaminate your property, local rivers, and groundwater. Our portable wash pads capture contaminated water so you can treat and recycle the wash water, which in turn protects your property and the environment from wastewater contamination.